Christianity took its time establishing itself in Britain. The Romans might have conquered the island just over a decade after Christ’s death, but until the sixth century AD, the new religion maintained only a tentative hold over certain sectors of British society. Then, in 597 AD, Pope Gregory the Great sent St Augustine on a mission to convert the pagan Saxons at the court of Aethelberht of Kent. Augustine triumphed- and Aethelberht set about Christianising Saxon Britain. Britain, however, had several millennia worth of accumulated pre Christian religious beliefs and practices behind it. 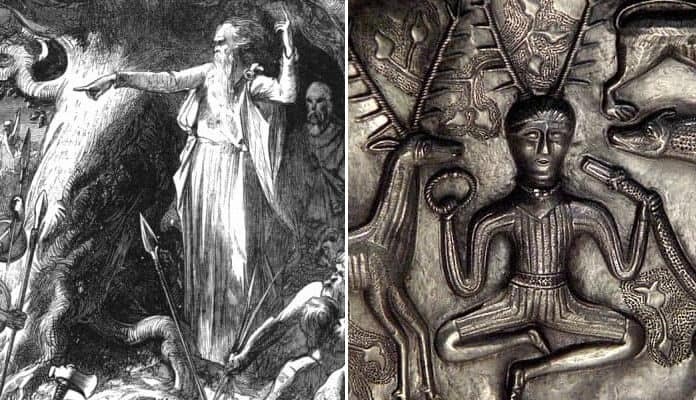 Barbaric, surprising or curiously familiar, many of these beliefs survive today, as folk memories, archaeological relics – or within Christianity itself. Remains of a Paleolithic male known as the “Red Lady of Paviland” found in southern Wales. Picture Credit: Ethan Doyle White. Creative Commons Attribution-Share Alike 3.0 Unported license. English Wikipedia. 16. British hunter-gatherers began to ritually bury their dead 33,000 years ago-as the Welsh Red Lady of Paviland prooves. Thirty-three thousand years ago, Britain was enjoying an interglacial lull. The warmer temperatures attracted groups of hunter-gathers, who crossed the land bridge from Europe and began to roam the British peninsula hunting for game. One day, a group was hunting mammoth around the Gower peninsula in Wales, when one of their group fell. The hunter was young; six foot tall and in the peak of health and so a devastating loss to the group. His companions must have felt the young hunter’s loss keenly because they did not just dispose of the remains but buried them with some ceremony. The hunting party took their fallen companion’s remains to what is now known as Paviland Cave where they laid him to rest in a shallow grave. As part of the pre-burial preparations, they defleshed the body and rubbed its bones with red ochre, a pigment still associated in many cultures today with blood and rebirth. They then interred the remains with a collection of periwinkle shells and ivory rods. The man who found him, the Reverend William Buckland, assumed the shells and rods were the remains of jewellery and so mistook the hunter for a Roman prostitute! This misidentification and the red-stained bones earned the remains the name ‘The Red Lady of Paviland.” Misidentified or not, the Paviland grave is the earliest example of a ceremonial burial in Western Europe.